The Andover 55-inch solid wood bathroom vanity offers generous storage and counter space. It's finished in antique black and has a contrasting Carrara white marble vanity top and white sink for a timeless look. It was made using environmentally friendly oak hardwood, as well as a 12-step hand-finishing process for stunning and trouble-free looks and performance for years to come. With a traditional look and strong design, this vanity will help any bathroom look nicer. The beige tan marble counter and white solid wood base make this piece great for any bathroom. With a double-door cabinet and drawers, this vanity can hold all kinds of bathroom items. Add a classic feel to your bathroom with this simple vanity set from Wyndham Collection. For some added classic style in your bathroom, choose this beautiful vanity. With a beige tan marble counter and black solid wood base, this piece is very stylish. Put away your bathroom items in the double-door cabinet. This classic set from Wyndham Collection will make your bathroom look brand new. With its classic design, antique black finish and decorative carved flourishes, the Andover 60-inch double-sink vanity makes the perfect centrepiece for your bathroom. This piece represents an updated take on traditional styling. For storage, a 2-door cabinet, two interior shelves and three drawers provide plenty of space to keep all your toiletries and towels out of your way. Enjoy the popular classic look in your bathroom with this beautiful vanity. Its comes with a nice beige tan marble counter and black solid wood base for strength and style. Keep many bathroom items in its roomy drawers and double-door cabinet. Put a classic feel in your bathroom with this good-looking set from Wyndham Collection. 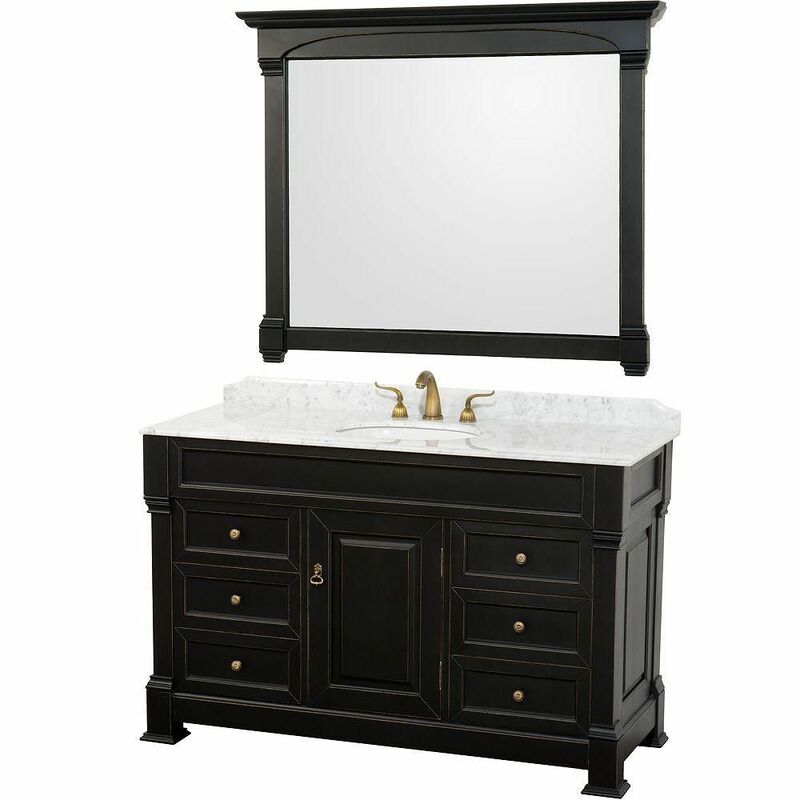 Andover 55-inch Vanity in Antique Black with Marble Vanity Top in Carrera White and Mirror The Andover 55-inch solid wood bathroom vanity offers generous storage and counter space. It's finished in antique black and has a contrasting Carrara white marble vanity top and white sink for a timeless look. It was made using environmentally friendly oak hardwood, as well as a 12-step hand-finishing process for stunning and trouble-free looks and performance for years to come. Andover 55-inch Vanity in Antique Black with Marble Vanity Top in Carrera White and Mirror is rated 5.0 out of 5 by 3. Rated 5 out of 5 by HomeDepotCustomer from Very nice vanity and Carrera top Very happy with the high quality of this vanity, top, sink and mirror. Matches our carrera shower nicely. Know that the backspash comes already glued to the carrera top with heavy cement-type glue. Hadn't planned on that since the instructions said purchaser would have to glue the vanity and backsplash together. We paid someone to cut off the carrera backsplash (not an easy task) so we could add a mosaic backsplash that matched our shower. Our contractor did his magic to hide the scuff marks left on the top after the cutting. This vanity is a beautiful addition to our bathroom. Also know that the mirror is very heavy and large, but also very nice. Rated 5 out of 5 by Teeni from Very satisfied with our new vanity and the Home Depot customer service We had the vanity shipped to our house. It arrived in 4-5 boxes with no damage at all. We had our contractor install it and he commented that it was very well built and made of high quality materials.